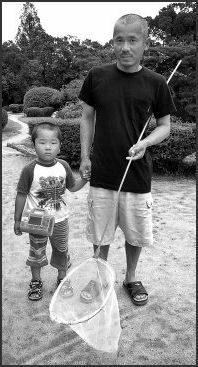 a popular father and son activity According to a survey on recreation in Japan, 76 percent of the people interviewed said they liked to spend their free time traveling around Japan. Other activities that ranked high were driving, followed by overseas trips, picnics, hiking, and cultural activities such as movies and concerts. According to a 2010 Japan Post Insurance survey 61.4 percent of health-concious Japanese cited walking as they activity they like to do to stay healthy. The ancient Japanese tradition of yu-suzumi, or "enjoying the evening cool." Typical yu-suzumi pastimes include boat rides, walks along the waterside, and watching fireworks. Running up long series of stairsoften the ones leading to Buddhist temples or Shinto shrinesis a common training method in Japan. Modern forms of recreation are displacing traditional Japanese art forms. According to a 1997 government White Paper on Leisure, twice as many women are interested in personal computers than the tea ceremony and three times more would rather go bowling than engage in traditional flower arranging. In 2009, retailers noticed that consumers were becoming more interested in purchases that related to a hobby or provided a skill. Particularly popular were cooking classes, golf lessons and equipment and gardening products. Air Sports Saga International Ballon Festival Saga Balloon Festival ; Paragliding in Japan Paragliding.net ; Japan Hang and Paragliding AssociationJapan Hang and Paragliding Association ; River Sports Rivers and Creeks in Japan ; Outdoor Japan Outdoor Japan ; Canyons.jp Canyons If you google Kayaking Japan a lot of different operators in different parts of Japan turn up. 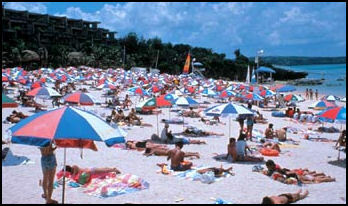 crowded beach in Okinawa Public swimming pools in Japan can be very crowded. They generally dont have deep ends or diving boards and no diving is allowed from the sides of the pool. Every hour or two the pool is emptied, with most everyone standing on the deck doing stretching exercises to piano music. Nearly every school in Japan has an outdoor swimming pool. In elementary school swimming lessons are part of the school year curriculum and are offered free during the summer. The goals is teach swimming to kids so they can enjoy the sport and feel safe around water. In June when the swimming lessons at school start parents are given detailed handouts of what is expected of them and their children. Students must wear regulations swim suits and caps with their name, grade and class written on them. Parents are supposed to check their child's temperature every day and mark it on a card that says their child is healthy enough to swim that day. Parents put their hanko (chop) on the card. If a child does not have the card he or she can not swim that day. deserted beach in the Izu Islands Students change into their swim suits at school, with girls in one classroom and boys in another. They carefully stretch and shower, and sometimes walk through a hip-deep pool of disinfectant and finally enter the pool about 60 at a time. The kids regular classroom teacher dons a bathing suit and teaches the classes. The students are taught different skills and proceed up a ladder of 15 ranks. Students in many places are required to swim a certain distance such as 100 meters, 200 meters or 400 meters. If they cant they have to attend a special summer training program. Some nice beach are just a small inlet or peninsula away from large industrial zones, nuclear power plants or thermal power plants. 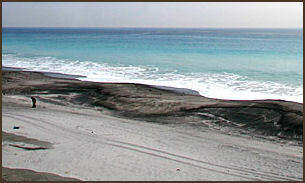 Many beaches are artificial with sand dredged and brought in by special ships. Although the six had planned to swim along the ocean currents toward Su-ao, they altered course to take the shortest route because of Typhoon Roke's off Okinawa. The team was accompanied by a ship carrying a 10-member support crew, including a doctor. "We want to communicate our gratitude and enhance ties between Japan and Taiwan," Suzuki told reporters before his departure. He was the first to propose the goodwill relay project. The Taiwanese people sent a total of 6.7 billion New Taiwan dollars, or ¥17 billion, in donations to those Japanese afflicted by the disasters. Marathon running is very popular in Japan, with marathons around the country often reaching their quotas just days or even hours after opening their doors to receiving applications. The 2011 Tokyo Marathon received 336,000 applications for 36,000 entries. Among those allowed to run in 2011 was Chilean miner Edison Pena, one of the 33 miners rescued in October 2010. The 2011 Tokyo Marathon was won by a Kenyan. Finishing in third was Yuki Kawauchi, who pulled off the feat and qualified for the World Championshiop marathon even though he is not a professional runner and has no corporate sponsorship but rather is a government office worker who trains in his spare time. In January 2011, 61-year-old comedian Kampei Hazama completed his run-and-sail Earth Marathon around the world, finishing in Osaka Castle Park, two years after starting. The 41,000-kilometer feat took him through 18 countries and was interrupted for treatment for prostrate cancer. He started the trip by running from Osaka to the Tokyo area, then sailed to the United States and ran across North America. He then traversed the Atlantic Ocean in a sailboat and jogged across Europe and Asia . He is the first known person to have completed such a trip. Surfing is popular in Japan. Some surfing beaches are on one side of a highway with ugly concrete highrises on the other. Surfing is also a fashion with many surfers seeming more interested in accessories than the sport. The same can said about skateboarding, where dressing the part oftem has precedence over skateboarding ability. There are around 600,000 certified scuba divers in Japan. The fatality rate among scuba divers is failry high in Japan. A total of 182 divers died between 1999 and 2007. In one case two divers died on a single dive off the Amami islands in Kagoshima Prefecture after becoming separated from their group. The scuba instructor it turned out never held a divers license, let along a diving instructors license, He was sentenced to 16 months in jail for professional negligence. Skiing in Niigata Prefecture peaked in 1992 with 15.92 million skiers visiting the prefecture. In 2009 only 4.93 million skiers visited the prefecture. These days ski resorts and onsens in Niigata and Yamagata and other prefectures in northern Japan that have experienced sharp declines in the number of Japanese visitors are trying to attract more skiers and bathers from Asia, namely Taiwan, China and South Korea. In the mid-1990s, snowboarding caught on with Japanese youth in a big way. Snowboarders became a fixture of television commercials, stores carried a dozen or so specialty snowboarding magazines, and number of snowboarders jumped from 200,000 in 1992 to 800,000 in 1996 to 5.4 million in 2000 and has remained steady for several years, before dropping off. 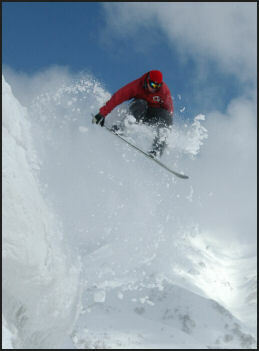 Japan now accounts for 20 to 30 percent of the $800 million annual global snowboarding industry. A typical Japanese snowboarders not only dishes out $500 for a snowboard he or she also spends up to $1,000 on the prerequisite snowboarder outfit: baggy pants, thick-soled sneakers, baseball caps, and formless windbreakers. Indoor ski slopes usually have a slope for snowboarders but, ironically, snowboarding is banned on the slopes where the snowboarding competition at the 1998 Winter Olympics in Nagano took place. 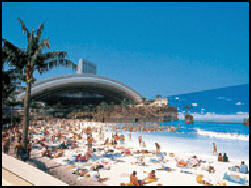 Seagaia Japan is famous for it atrium-covered indoor beaches and ski resorts. Even though the real mountains and the real ocean are only minutes away, many parents prefer to take their children to indoor ski slopes and indoor pools with machine- generated waves because they consider the man-made facilities to be safer. Seagaia Resort, near Miyazaki on Kyushu, was billed as the world's largest indoor water recreation center. One hundred meters wide, 300 meters long and 38 meters high, it featured a huge 10,000-person wave pool, artificial beach made of crushed Chinese marble, bikini clad girls, a man-made volcano that erupted every 15 minutes, and a variety of slides, shops and snack bars. Ironically the real ocean was only a few minutes away. Waves up eight feet high were generated by machine with 40 computer-controlled vacuum chambers. It contained a convention hall, water complex, 99 holes of golf and four hotel, including one with 45 floors and 753 rooms. Underneath the blue sky painted onto the complex's ceiling (which slides open in nice weather and was the world's largest retractable ceiling) are man-made clouds, which slowly drift by. Seagaia resort was conceived in 1988, during the height of the Bubble Economy, and built at a cost of $2 billion, Opened in 1994, it attracts about 2½ million visitors a year and was Japan's fifth largest theme park after Tokyo Disneyland, Universal Studios Japan, DisneySea and Huis Ten Bosch. In 2001, Seagaia resort filed for bankruptcy. It expected to show a profit in its first year based on the assumption it would attract 5.5 million visitors. It only attracted 2.7 million that year and 3.86 million the next year, which was not enough to make it profitable. By 1999, it owed more than $1.2 billion and ut bank refused to lend it any more money. 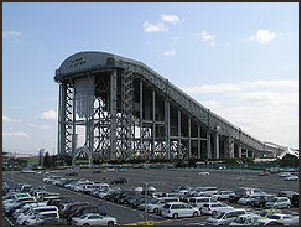 Lalasport Ski Dome (Unabashi, train ride near Tokyo) was the world's largest indoor ski slop. Enclosed inside a building that looked like a "cross between a skyscraper and an airplane hanger," was a man-made slope that is 1,344 feet high and 275 feet wide and used about as much energy per day as the Empire State Building. Every morning before the customers arrived about a centimeter of ultra-fine snow particles, a tenth of the size of an average snowflake, descended from the sky blue ceiling. It closed in early 2000s. "The ski hill," writes T.R. Reid in the Washington Post, "is one broad slopeabout as wide as football field is longwith high speed four-person chairlifts on either side. Once at the top you have to make a choice. At the top right (looking down), the slope is steep enough to be rated "advanced." In the center and the left end of the hill, the slope decreases considerably. The "advanced slope is steep enough and snowy enough to develop actual moguls, and we found the run fairly interesting for a half hour or so." The $360 million Ski Dome was outfit with thick foam cushions on the walls to protect skiers from injury and had a jump where skiers and snowboarders tried to perform elaborate stunts. At the bottom of the slope was a ski lodge where skiers could enjoy a cup of cappuccino, hot chocolate or instant ramen, and luxurious locker rooms. From the outside the indoor ski slope looked like a 25-story metal box. It boasted the world's largest refrigeration bill. The chair lifts whisked skier and snowboarders to the top of the slope in less than two minutes. To reach the beginners trail about halfway up the trail skiers could take a beltway that moved along at the speed of a fast escalator. The huge refrigerating units that keep the temperatures inside the building below freezing were under a concrete floor below the snow. Two hour lift tickets were $54 for adults and $41 for children; Rental gear was $17 for adults and $14 for children. An increasing number of Australians and South Koreans are skiing on Japanese slopes in Hokkaido and the Nagano area. traditional Japanese kite Kite Fighting is Hamamatsu is taken so seriously that special police are often brought in break up fist fights and keep people from getting trampled to death. Shirone Takogassen is a huge kite fighting festival in June that last for five days and is held along the Nakanokuchi river bank in Shirone, Niigata Prefecture. Over 300 years old, it is said to be the worlds largest kite fight. About 300 kites take part. They are made from bamboo and washi paper and can be as large as 23-x-17 feet and weigh as much as 50 kilograms. Each kite has a unique design that has in some cases remained unchanged for three centuries. 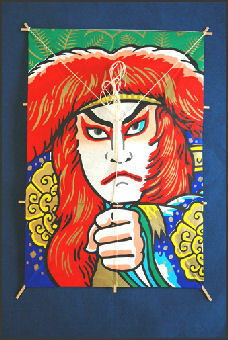 Tsugaru kites are often decorated with well-known historical figures. Many have ukiyoe-style pictures. The rope is made at great expense from hemp. Teams from Shirane compete against teams from nearby Akikatamaru village. In a typical fight one kite from Shirone is raised on one side of the river and a second kite from Akikatamaru is raised on the other side of the river. Teams of 30 to 50 men run along the river bank, pulling the kites towards one another. The teams the severe the others lineusually in just a few minutesis the winner. Seven matches are held with seven groups from each town. The number of battles won and the amount of time the kites stay aloft determines the overall winner. Japan experienced a bowling craze in the 1970s. It peaked with 120,000 lanes at 3,700 locations and then crashed and stabilized at 40,000 lanes in less than 1,000 locations. For a while Fukuyama Bowl in Osaka, with 156 lanes, was the world's largest bowling center. To attract customers bowling alleys feature fancy bars and salons, fancy lighting, lanes that can be curtained off. One alley dims the lights and turns on red and blue lights that follow the balls,. In an effort to generate more interest in bowling, bowling alleys are targeting kindergartners by sponsoring certain days in which young children can bowl for free, using special lightweight balls they can roll with two hands and hire a man in a panda costume to entertain the kids in hopes that they will want to come back. Gateball is an outdoor popular with the elderly. Modeled after croquet, with elements of golf and curling thrown in, it is played with three wickets and a single post and it is a team game with five members on two teams hitting balls in turn, and requires great skill to place the ball where the team captain wants. One missed shot can spell doom for a team. When players hit their opponent's ball many do it gently rather than aggressively. Gateball was created in Memurocho, Hokkaido in 1947. The game was originally devised as an easy game for children but it was picked up by a home for the elderly in Kumamoto Prefecture as good game for old people after the Tokyo Olympics generated nationwide interest in sports. After that gateball quickly caught on with elderly across Japan. According to the Japan Gateball Union, more than 6 million people played the sport when it was at its peak in 1990. Now about 2 million play it. In the late 2000s gateball became increasingly popular with young people with some high schools having teams and competing in the All Japan Junior Gateball Games. One team player told the Yomiuri Shimbun, Its so thrilling when my turn to hit comes around. Even if someone misses a shot, our teamwork can guide us to victory. In the meantime many elderly people have switched to ground golf a game in which players hit balls with a mallet into cages set up around a field. 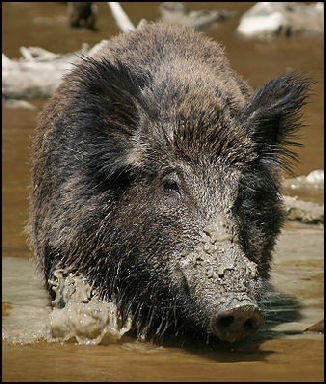 wild boar Hunters in Japan go after wild boar, pheasants, deer, hares, ducks, dove and bulbul and sometimes bears. There are special rules for registering and storing guns (see Crime). Some Japanese complain that hunters approach too close to residential areas. Ive encountered them on hiking trails. Japan has the world's strictest gun control laws. There is a total ban of handguns, except for legitimate antique gun collectors and licensed shooting teams. Japan gun control laws date back to 1588, just four decades after firearms were introduced by the Portuguese. Getting a gun license takes an average of four months and a series of special training courses to acquire. Buying a hunting rifle requires enduring a lengthy waiting period and going through a rigorous background check. Japan's registered shotgun owners and licensed samurai swordsmen are required to keep their weapons in lockboxes that are inspected by police once a year. Even nail gun used by carpenters have to be registered. To obtain a hunters license one must listen to lectures and pass two tests in Japanese: the first is on laws; the second is firearms safety and animal identification. The fee for the license is approximately ¥30,000 per year. Every three years a hunter must take a refresher course and submit new paperwork. To own a gun one must go to the police and make a case of why you need one. If the request is approved the applicant needs to take two tests on law and safety. Upon passing the tests one can apply for a permit for a particular kind of weapon. Upon purchasing a weapon one must register it with police, confirm that it is kept under lock and key at all times and submit to a background check. Each year the weapons must be brought to the police at a specific time for a check. The number of hunters has dropped by about half over the past 30 years to about 200,000. The decline is due primarily to the fact that older hunters are dying off and few young people are taking up the sport. Few young people are interested in hunting, plus many Japanese find the idea of killing animals abhorrent and dont like guns. And then there are the gun laws. After a random shooting incident in Sasebo, Nagasaki Province in 2007 people who want to own a hunting rifle are now required to submit a certifiicate from a psychiatrist stating they are sane enough to shoot a gun, which turns people off to hunting. edo fishing rods In Japan, you can often see old men around inner city ponds fishing for carp. In the mountains there are recreational ponds where you pay a fee to catch fish and rent poles as if you were at a bowling alley or a on a ski slope. In some urban areas you can find game centers that have small indoor ponds used by fishermen. One facility in Osaka has a 9-x-8-meter pond that is stocked with 1,700 fish of three carp species. Fishermen pay ¥1,400, which includes fishing tackle and bait. Children catch crayfish in ponds with a fishing rod, using crayfish as bait to take advantage of crayfishs cannibalistic inclinations. Japanese fishing tackle businesses are producing environmentally-friendly fishing gear such as weights that use something other than lead, which slowly dissolves in water and can poison the environment, and lines and lures, which can break and become entangled around fish, turtles, other sea creatures and birds. The new weights are made of iron or tungsten which are not as environmentally-destructive as lead, and fishing lines made of biodegradable materials. Quality bamboo fishing rods made by Kisaburo Nakane, a forth generation rod maker, who works out of the Saochu tackle shop in Tokyo makes traditional Edo-style rods using 120 processes, including cutting and heating the bamboo and applying. It takes three months to a year to make such a rod. 30 coast of lacquer Baleen from bowhead whales to transfer delicate vibrations down the rod to the fishermans hands. 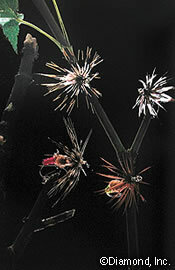 The making of flies and lures is also a an art form practiced by skilled craftsmen. Lures to catch ayu, or sweetfish, is a specialty of Kanazawa. They are made from one-centimeter long hooks and gilded led balls that have different kinds of feathers and different colored threads tied to them. Different patterns are used depending on the temperature, sunlight and water conditions. One store in Kanazawa that has been open since 1575 offers 900 different lures. The owners recommends using red lures in the morning and blue or green ones in the afternoon. Ice fishing inside tents for small wakasagi fish and pond smelt is popular on Lake Haruna in Takasaki, and Onuma Lake in Fujimimura, both in Gunma Prefecture, Before fishing is allowed the thickness of the ice is checked at four points around the lake is only authorized if the thickness exceeds 15 centimeters. In the winter of 2006-2007 the ice never reached that thickness and no ice fishing was allowed. In December 2009, six sports fishermen were killed and one survived when their boat capsized in heavy seas and frigid waters off Hokkaido. Many thought the fishermen were stupid to be out in such rough weather. fishing lures Black bass (also known as large mouth bass) are a favorite catch for fishermen in the United States. They were intentionally released in Japan by fishing enthusiasts and bait salesmen as well by some local organizations hoping to attract fishermen. Black bass can lay eggs up to three times year and they are voracious carnivores that feed on the eggs and fry of other fish. The first black bass were reportedly brought from California and placed in Lake Ashi near Tokyo in 1925 by a fishermen who found them sporting to catch. Over the years more were introduced and spread, with some even finding their way into the moat around the Imperial Palace. But at home bass fisherman are regarded as outlaws, and worse than that, bad mannered louts. Bass fishing is especially popular with men under 30. There are clothes, gear and magazines and even bas fishing video games designed for them. Some of the top professional bass fishermen in the United States are Japanese. In 2005, bass angling top prizechampion of he Bassmaster Classicwas won by Japanese fisherman Takahiro Omori on Lake Wylie in North Carolina. It was the first time a non-American won the event. On the final day he was able to land three fish weighing 39 pounds and two ounces that have him a 2.75 pound advantage over the second place finisher. Omori arrived in the United States in 1992, speaking hardly any English, with the sole purpose of making it as a professional angler.